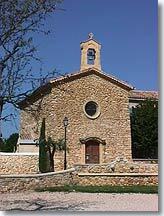 The Departement of Bouches du Rhone - Population : 1,200 h.
7 km North West of Aix en Provence on the D10. 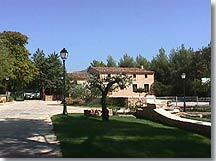 Nestling in the verdant countryside around Aix en Provence, Saint Marc Jaumegarde is pleasantly situated close to the famous Sainte Victoire mountain, surrounded by small valleys, hills and some rolling countryside. Little more than 15 minutes from Aix en Provence on a small calm road, here you'll be far from the crowds and noise amongst all the delights that nature can bring. 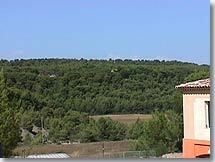 This small picturesque commune spreads along the line of the Prignon stream with the Bimont lake and its dam on one side and on the other, the neighbouring village of Le Tholonet, and the small Zola's lake (Emile's father). 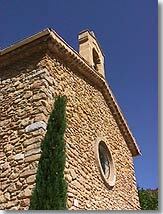 Saint Marc Jaumegarde is not like a typical provencal village with its small general store, cafe/bar and bread shop, and its houses clustering around the main square. It is more like a number of smaller hamlets with groups of housing spread around the area of the commune. You will pass by a number of small lanes indicated with signs that invoke famous names and which seem to invite you to discover all of the surrounding environment. The places and small neighbourhoods are private, with recent housing or beautifully restored provencal bastides. 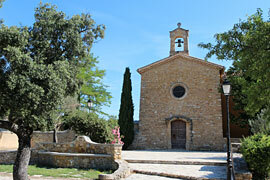 There are few remains or places to visit in the village except for the the beautiful roman church next to the town hall which was restored in 1869 and 1966. Here you can find a beautiful painting by Finsonius "Le Christ jardinier"and on the Esplanade des Plaines you'll see a formerly fortified château. The real charm of Saint Marc Jaumegarde is the surrounding nature, the calm and the quality of life which seems to reign over the village... All that, and right next to Aix, one of the most interesting towns in Provence ! 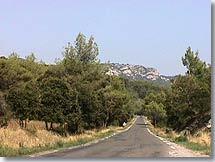 Le Tholonet (5km), Aix en Provence (7km), Vauvenargues (7km).